We had a full slate of games Tuesday, with all 15 matchups as night games. The Boston Red Sox and New York Yankees faced off in the Bronx, for the first time this season. We take a closer look at Boston starter Chris Sale and his struggles in the 8-0 loss to the Yankees below. Since the American League East rivals were off on Monday -- Jackie Robinson Day -- the players all wore No. 42 in Robinson's honor during Tuesday's game. Milwaukee Brewers outfielder and reigning National League MVP Christian Yelich continued to absolutely dominate the St. Louis Cardinals, blasting his eighth homer off the club's pitching staff. The defending NL Central champion Brewers are in first-place, with a game and a half lead over the Pittsburgh Pirates. All that and plenty more in our daily roundup. Check out everything you need to know from Tuesday's MLB action below. Select games can be streamed regionally via fuboTV (Try for free). For more on what channel each game is on, click here. The Boston Red Sox (6-12) traveled to the Bronx to face the New York Yankees (7-9) for their first matchup of the 2019 season on Tuesday and New York three-hit Boston in an 8-0 win. It's the first time since 1992 that the two teams are facing each other, both with records below .500 this deep into a season. New York's James Paxton struck out 12 batters in eight innings. As MLB Stats notes, Paxton became the first Yankees pitcher to throw at least eight innings with 12-plus strikeouts against the Red Sox since Mike Mussina in 2001. Paxton's eight innings also gives him the longest start by a Yankees pitcher this season. Boston's Chris Sale saw his average fastball velocity rise (97.5 mph) but still struggled against the American League East rival. Our own Mike Axisa was at Yankee Stadium for the game, and has more on Sale's rough outing here. With 12 players on the Yankees injured list, the team has been forced to rely on contributions from the reserves and injury call-ups so far this season. The second and third stringers fared very well in the win over Boston on Tuesday, here's a breakdown of their productivity from Axisa. The Tampa Bay Rays defeated the Baltimore Orioles 4-2, behind starting pitcher Tyler Glasnow. Glasnow allowed two runs over seven innings, winning his fourth consecutive start to begin the season. The 25-year-old right-hander allowed just one hit over his final 4 2/3 innings and ended the outing by retiring 10 in a row. Our own R.J. Anderson took a closer look at how some of the adjustments Glasnow made to his pitching approach have helped his early season success in 2019, check out the piece here. After a 2-5 start to the 2019 season, the Houston Astros have since gone on to win 10 straight games. First, they swept the Oakland Athletics, then they competed three-game sweeps of the New York Yankees and Seattle Mariners. On Tuesday night, the Astros beat the A's 9-1 at the Oakland Coliseum. The Astros are currently half a game up in first place in the American League West, after the Seattle Mariners lost their fifth straight game. Alex Bregman blew the game open with a grand slam off A's lefty Liam Hendriks in the fourth inning. It's even crazier in slo-mo. You're not human, are you, McHugh? Christian Yelich has homered against the St. Louis Cardinals eight times this season. In the Brewers' 8-4 win over the Cardinals on Tuesday, he hit another blast to become the first player ever to hit a home run in six straight games against the Cardinals. It was his ninth homer on the season, so eight out of the nine have all been against St. Louis. Facing recently-promoted Cardinals righty Ryan Helsley with two outs in the fifth inning, Yelich evened a 0-2 count and hit a three-run home run, 427 feet to right-center field. The Brewers have won nine of their last 10 against St. Louis, including four in a row. Milwaukee (12-6) currently sits in first-place in the National League Central, with a game and a half lead over the Pittsburgh Pirates. Urshela took over as the Yankees' starting third baseman after Miguel Andujar suffered a right labrum injury in the third game of the season. The Tampa Bay Rays placed starter Blake Snell on the 10-day injured list with a toe injury, and he's expected to miss one start. We have more details on Snell's injuries here. The Red Sox designated catcher Blake Swihart and recalled Sandy Leon to help their pitching staff get right. Details of the swap are here, and a breakdown of what we've learned from Boston so far this season here. On Tuesday, the Yankees added first baseman Greg Bird to their 12-player long injured list. More on that here. Philadelphia Phillies closer David Robertson has been diagnosed with a grade-1 flexor strain in his right elbow. 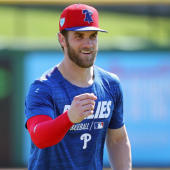 Phillies manager Gabe Kapler told the media, including The Philadelphia Inquirer's Matt Breen, that Robertson will not throw for a couple days before being re-evaluated.